Special offer for a limited time only. 40L + 25%= 50L sack. A complete, balanced, staple diet, suitable for all pond fish. 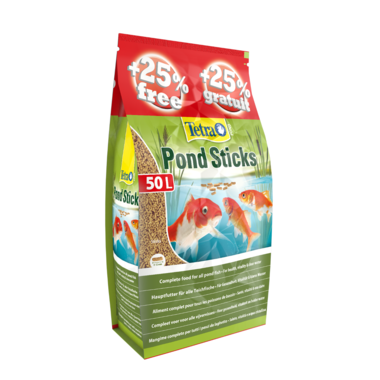 TetraPond Floating Food Sticks are an ideal maintenance diet that provides nutrition for energy, longevity, and overall health. 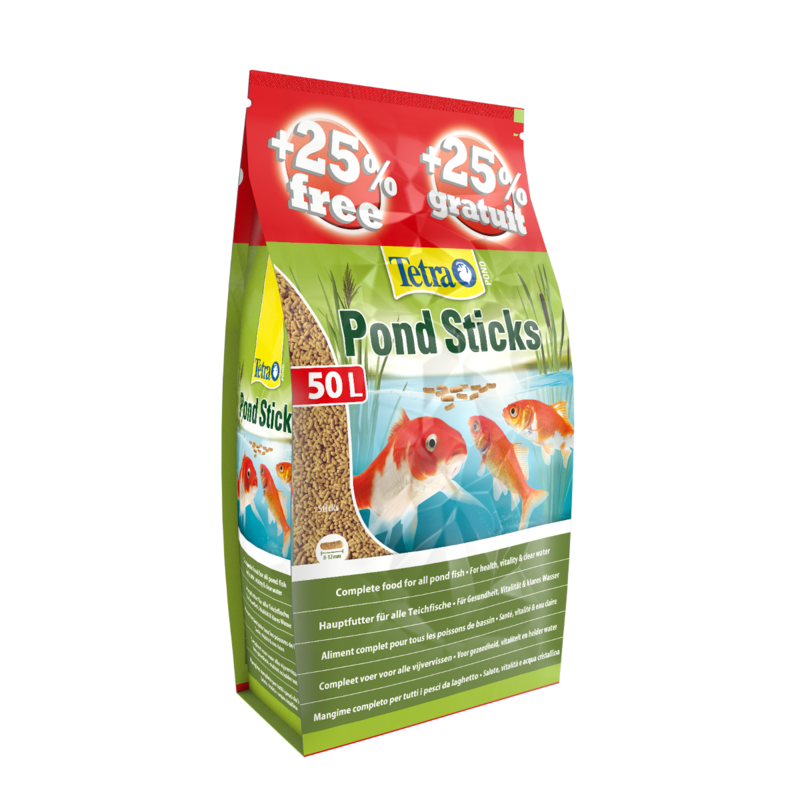 Tetra Pond Sticks are a complete food that has been formulated for use with all Pond Fish. The Floating Pond Sticks contain all the essential nutrients, fibre, minerals and vitamins that support a biologically balanced diet that gives all round benefit to your pond fish. The stick food has a patented active formula that helps to maintain a healthy immune system, energy and vitality. This gives all pond keepers peace of mind as it ensures all their fish are getting the balanced diet they need. And because the sticks float on the surface, its easy to monitor how the fish are eating and gives easy access if additional food needs to be removed. Each stick measures approx 8 -12mm and softens quickly for easy feeding and are highly digestible. The special formula also ensures that any left over food has no additional impact on the waste in your pond. What also makes the Floating Pond Sticks a great choice for your pond, is the lower levels of phosphates in the food. This helps to reduce the risk of algae building in the pond and helps to improve water quality. Feed your fish Tetra Pond Floating Sticks 2 -4 times a day depending on the temperature, feeding only as much as the fish will consume within a few minutes. Below 10°C, stop feeding Tetra Pond Sticks and switch to Tetra Pond Wheatgerm Sticks.